Test your LabVIEW Code the JKI Way! Sign-Up to Download the Toolkit for Free! 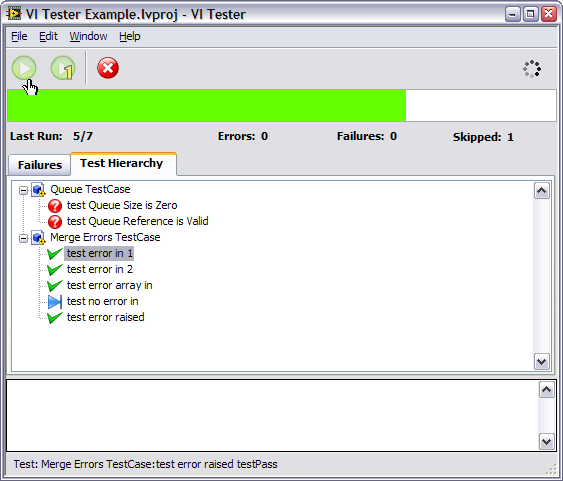 VI Tester is a software test framework for LabVIEW by JKI that allows software developers to test their LabVIEW code (VIs). Software testing is a critical component of agile development and test driven development processes and is also critical for validating software functionality. VI Tester is based on the industry standard xUnit software test architecture that is used in many other programming languages. This architecture is very flexible and powerful, but also very easy for beginners to learn. Plus, Caraya is used by the JKI team of LabVIEW experts to test our own code. Try it today! What Can this Toolkit Enable You to Do? Use a the Graphical User Interface for running tests -- a.k.a the "Graphical Test Runner"
Leverage an Object-oriented Test Framework -- the core architecture of the test framework is based on an OOP model and makes it a great tool for testing object-oriented LabVIEW code. Is this Toolkit Really Free?